Hugga-Bébé is a support for children 4 months thru toddler years to use in activity centers, jumpers, walkers, high chairs, park bucket swings, Bumbo Seats, etc. The way a child sits can have long-term effects all the way into adulthood. With Hugga-Bébé having your child sit proper is simple. Hugga-Bébé gives children the ability to sit without having to slump over or flop around. When your child is little learning to sit (good posture) is a must. Hugga-Bébé allows for proper alignment for children to develop the core muscles, giving them the trunk control to sit properly. Teaching a child to sit can have as much impact on their physical health, self esteem and processing as does teaching them to talk and walk. There is clear evidence that chronic back pain can be a result of poor sitting habits stemming all the way back to childhood. It is important for children to maintain the 3 major spinal curves at the neck, upper and lower back no matter what age the child is. At the same time the pelvis should be in a neutral position (not tilted forward or back). A slouched posture can be damaging to say the least. 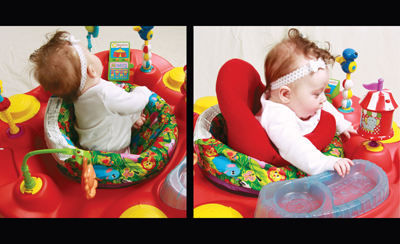 Hugga-Bébé allows children to have good posture from 4 months thru toddler years. A strong trunk enables a child, for instance, to breathe more effectively and use his or her extremities more efficiently. Give children the love and support they need from Hugga-Bébé.